Michael D. Frost, Ph.D., of Mission Hills, KS and owner/CEO of Continental Steel Fabrication Company of Kansas City, MO receives a ceremonial copy of a Commonwealth of Virginia General Assembly Joint Resolution commending the 300th anniversary of the Knights of the Golden Horseshoe Expedition, led by Frost’s ancestor Alexander Spotswood, who was Lieutenant Governor of the Virginia colony in 1716. Frost serves as a trustee of the Germanna Foundation, a historic preservation nonprofit organization that preserves the history and legacy of the first German colonists settled in Virginia by Spotswood in the early 1700s, whose descendants now live across the country. The Kemper family of Kansas City is also among the many Germanna descendant families. Also pictured with Dr. 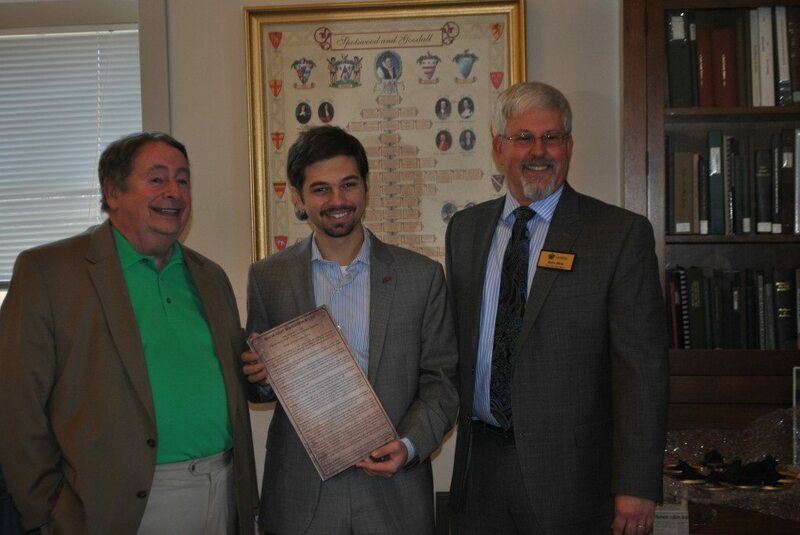 Frost (l) is R. Christian Heiens (center), legislative aid to Virginia Delegate Nick Freitas who sponsored the resolution, and Germanna Foundation Chief Operating Officer Steve Hein. The photo was taken at the Germanna Visitor Center in Locust Grove, Virginia, at the March 18 meeting of the Foundation’s Board of Trustees.